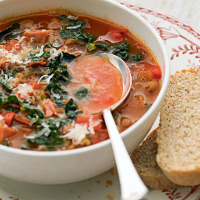 This warming soup makes the most of any leftover ham or gammon, and can be made quickly to produce a delicious lunch or light supper. Heat the oil in a large pan over a medium heat. Add the onion and pepper and cook for 10 minutes until softened. Add the ham to the pan and fry for about 1 minute to coat in the oil. Then add the stock and tomatoes. Bring to the boil, reduce the heat and simmer, uncovered, for 15 minutes or until reduced by about a quarter. Using a ladle, place about a third of the soup in a food processor. Blitz to make a thick purée. Return this to the pan and stir to combine. Return the pan to a high heat and add 250ml boiling water and the borlotti beans. Bring to the boil then add the cabbage. Stir in and leave to simmer for 3 minutes or until the cabbage is just tender. Ladle into warmed bowls and serve with grated Parmigiano Reggiano cheese, a sprinkling of chopped fresh parsley and some warm, crusty ciabatta bread. Try making the soup with other canned beans or pulses. Chickpeas, butterbeans or kidney beans work well.